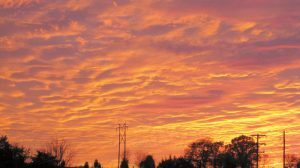 In the Midwest in the late summer, we have had some really spectacular sunsets. Brilliant oranges, reds, and yellows with a pink or peach tint. But the sights we have been able to enjoy have come at the expense of thousands in the Western States. The beautiful sights we saw were because of the smokey haze in the atmosphere produced by the rampant wildfires in California, Oregon, Washington, Montana, Colorado, New Mexico, Utah, Wyoming and Western Canada. 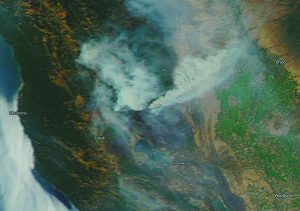 In mid-August, the U.S. Forest Service reported that an estimated 1 million acres have been burned in California wildfires this year. The vicious Carr Fire near Redding, California, had torched more than 207,000 acres, an area larger than New York City, since igniting on July 23. Flames have destroyed more than 1,000 homes in and around Redding, a town 200 miles north of San Francisco and home to 90,000 residents. The Carr Fire is now the eighth largest wildfire in California’s state history. As of late August, there remained 1600 fire teams working the Klondike and Taylor Creek fires in Southern Oregon. Seventy percent of Oregon is in a severe drought. In Oregon alone, there have been 723 wildfires consuming over53,000 acres. In Colorado, the Lake Christine fire on Basalt Mountain was started by illegal fireworks. The fire evacuated many from their homes. The fire then became contained and people were allowed to return – for one day. Then the fire jumped a road and a firewall, causing evacuation again. Now the concern for many of these areas is the threat of landslides when the rains come. The root systems that held the terrain in place are now destroyed.